Are you having the same issue that I have, kids not eating the veggies? There are only a few kids who eat everything, a perfect example is my daughter who loves food and is ready to try anything. She will tell you if liked it or not, but will never say no. On the other hand my son, doesn't like to try anything which makes it so hard for me. 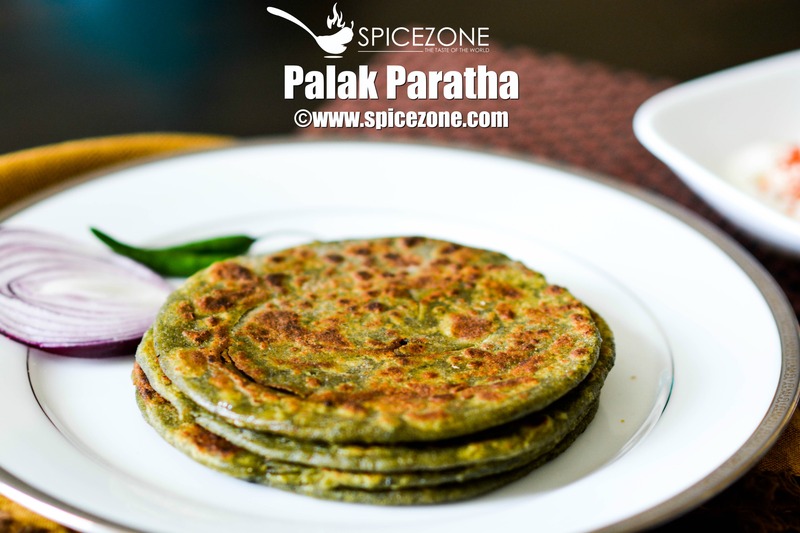 Palak Paratha is what I tried and see if my son will eat. 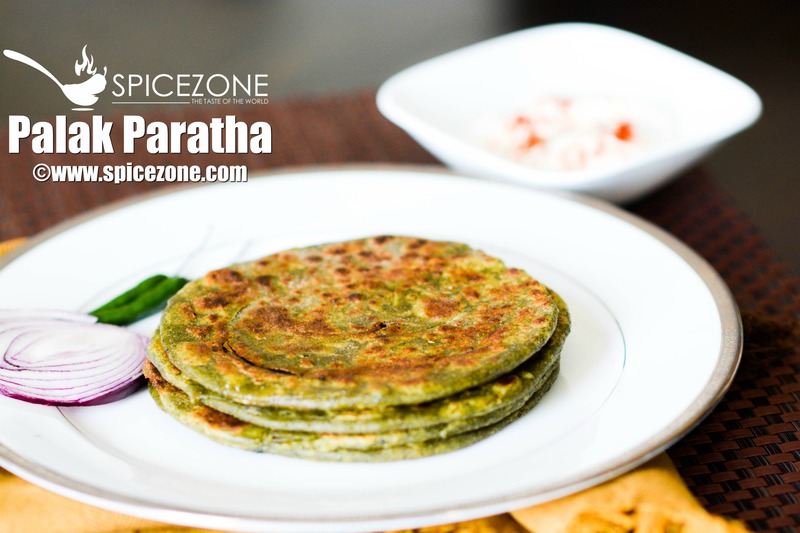 Palak Paratha is such an easy recipe with the goodness of spinach and its deceptively delicious. It is hard for anyone to incorporate different veggies in our diet, but if you can do it in a way that you can enjoy it then why not. You can make half cooked ones in one go and freeze it. Shallow fry them whenever you are in a mood to eat it. Lets take a few mins and talk about nutritional facts about spinach. Spinach is full of benefits and to name a few: diabetes management, cancer prevention, bone health, lowering blood pressure, healthy skin and hair and promotes regularity. To read a bit more details on this please click here. First blanch the chopped spinach in boiling water for a few minutes. Let it cool down. Now puree the spinach in a blender along with ginger and green chillies. In a mixing bowl, add wheat flour along with garam masala, salt, amchoor powder, red chili powder. Mix it all together, and add the spinach puree to it. Knead it using your electric mixer or if you don't have it then start kneading it using your hand. Add water as needed while kneading. Knead a medium soft dough and set it aside to rest for at least 20-30 minutes. Cover it with a wet napkin or with a lid. Heat the tawa or frying pan to cook the parathas. Divide the equally into small balls, size of your palm. Take one dough ball and place it in the dry flour turning both sides. Now place it on the flat surface and start rolling using a rolling pin. Make a small flat disc and put a little butter, salt and red chili powder if needed ( i do test the spices by making a tiny small paratha before starting to make the regular sized ones) and then bring the two ends together and make a square shape. Roll it using the dry flour if needed into a desired size. Try not to roll out too thin or thick. Once rolled place it on the heated tawa. Let it cook for a couple of minutes and turn it to the other side. Then turn again after a couple mins, put about 1/2 tsp of oil or ghee or butter whatever you are frying it in. Using a spatula, flip the paratha and let it fry. You can press lightly to make sure it has cooked evenly and then turn again. Add oil, butter or ghee if you need more and fry the other side.Make sure it is cooked evenly and it is crispy. Now your paratha is ready. Serve it with your favorite pickle and bowl of plain yogurt or a just a cup of tea. 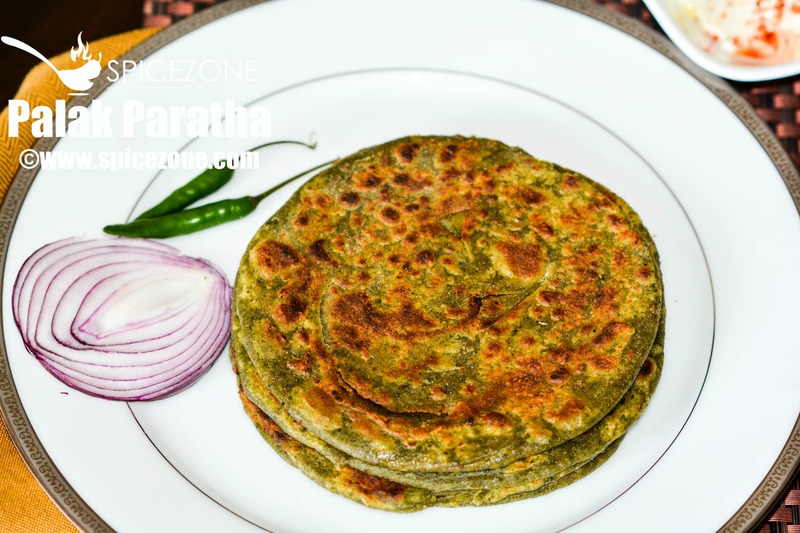 Palak Paratha, a deceptively delicious paratha with the goodness of spinach which can be enjoyed with your favorite pickle and bowl of yogurt. Roll it using the dry flour if needed into a desired size. Try not to roll out too thin or thick. Once rolled place it on the heated tawa. Let it cook for a couple of minutes and turn it to the other side. Then turn again after a couple mins, put about ½ tsp of oil or ghee or butter whatever you are frying it in. Using a spatula, flip the paratha and let it fry. You can press lightly to make sure it has cooked evenly and then turn again. Add oil, butter or ghee if you need more and fry the other side.Make sure it is cooked evenly and it is crispy. 2 Responses to "Palak Paratha | Spinach Paratha Recipe"
I can practically taste this just looking at your photos! This paratha makes me miss my mom’s stack of paratha she made every weekend morning!